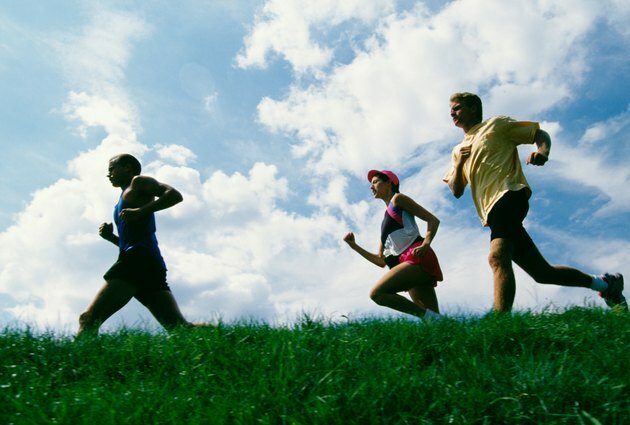 According to the Centers for Disease Control (CDC), running provides vigorous-intensity aerobic exercise, improves bone health and reduces stress. Whether you are training for a marathon or just trying to burn off a few calories, a wristband device that provides real-time performance data on distance, pace and elapsed time will keep you motivated and ensure you are getting the maximum benefit possible from your efforts. If you like to run long distances outdoors, consider a speed and distance monitoring device — such as one of the Garmin Forerunner series — that uses GPS (global positioning system) technology to track your run. These GPS-based units rely on satellite links to locate and record your route while they display, calculate and store speed, distance and time information on a one-piece unit worn on your wrist. This information can be downloaded to your computer, making it easy to compare your results over time and see your progress. GPS-enabled speed and distance monitors provide the most accurate data and are easy to share between runners because they do not require individual stride calibration to determine the distance covered. Some models provide heart-rate monitoring, some display elevation data and some let you set trip markers for backtracking or later runs. Other than their relative expense, the primary negative of GPS-based running monitors is that because they rely on satellite reception, they may not work indoors at the gym, in thick forests or in deep canyons of rock or buildings. Some models allow you to add a foot pod to provide data when GPS is unavailable. An accelerometer consists of a foot pod sensor attached to your shoelace that uses internal inertial technology to measure your speed and distance traveled, then wirelessly transmits the data to a wrist-worn display unit with timing capacity. According to Polar, a major accelerometer maker, the foot pod must be calibrated to each individual user to get the most accurate information. Some models allow you to set a target speed range and will alert you when you go above or below it. If you run primarily for cardio fitness, consider one that integrates with a heart-rate monitoring device. The advantage to distance and speed tracking devices using this motion/speed sensing technology is that they work anywhere. Accelerometers cost less than GPS-enabled monitors because they do not provide route-traveled information, which is unnecessary if you tend to run a few known routes. However, if you intend to share the device the foot pod must be remounted and recalibrated each time you use it, which some users may consider a negative aspect. The Centers for Disease Control and Prevention; Physical Activity for Everyone: How Much Physical Activity Do Adults Need?